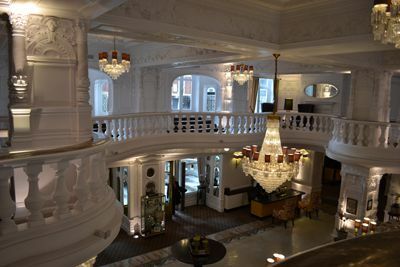 Enter the St Ermin's Hotel, through its recently restored, set back garden entrance you are confronted with the amazing fantasy of the curvaceous grand staircase and swirling rococo plasterwork wherever you look. Is this a hotel lobby or a Victorian opera house? Not a surprising impression when you consider the hotel's interiors - this grand lobby and several impressive ballrooms - were originally designed by London theatrical designer J.P. Briggs, who was also responsible for the York Grand Opera House, Doncaster Grand Theatre, and Tunbridge Wells Opera House. The St Ermin's decor, a combination of Art Nouveau, music hall baroque and rococo, with hints of Art Deco - pretty much everything a turn of the 20th-century designer could throw at it - must have been eye-popping in its day. But time and the hotel's slightly off the beaten path location took their toll. The St Ermin's is close to the heart of tourist London - Westminster Cathedral, Big Ben, Parliament, Buckingham Palace, Horse Guards, St James's Park - but not obviously so. Tucked behind Victoria Street, across from Scotland Yard and the headquarters of the London Underground, it was out of sight out of mind in a quiet corner of London even many Londoners don't know about. By the 21st century, it had become a shabby shadow of its designers' grand plans, a stop-over on cheap package tours with a bar used by local office workers. Now, following a change of ownership, the hotel has undergone a £30 million revamp and refresh. Sporting a newly earned 4-star status, the St Ermin's management promised modern luxury in an environment that, nevertheless maintained all the hotel's character features. With room prices that, while not cheap, are fair for such a central location, and two-bathroom family rooms available, the St Ermin's seemed worth a look. We decided to drop in for a bit of a snoop. The Bar Where History is Made? The Caxton Lounge and Bar at the St Ermin's is comfortably modern, with a zinc topped bar, warm leather walls, lots of inviting sofas and ottomans and open fireplaces. Since its revamp in 2011, the bar offers an upgraded list of international wines, beers from London microbrewery, Meantime, and a good selection of spirits. The bar also offers the currently fashionable trend of pouring wines, champagnes or whiskeys in "flights" of three, so that you can compare while munching on sharing plates and tapas. Well, it may be a bit of a stretch, but it is quite possible that at least two members of the Cambridge Five circle of British spies - Guy Burgess, Kim Philby - shared Cold War secrets with their Russian counterparts in this bar. It is a fact that for a time, both MI6 (James Bond's shop by the way), where Philby and Burgess worked, and other secret government organizations, had offices in the St Ermin's. Was this the spy local? Well maybe. But it's fun to imagine the motives of your fellow drinkers while knocking back a whiskey at the original bar. And as to history being made right now? There's probably not a bar or restaurant within such short walk of Parliament, Scotland Yard and countless government ministries where tomorrow's political memoirs are not being written right now. Just in case you doubt it, make sure to stop by the St Ermin's main lobby. Near the hotel's reception desk, you'll see the Division Bell. It rings to summon MPs back to Parliament when they are needed for a vote. Most bathrooms at the St Ermin's hotel have high-quality appointments by Villeroy &Boch or Porcelanosa but they're basically conventional in arrangement and facilities. The designers, however, have gone to town in the hotel's 41 luxury suites. There "wet rooms" behind sparkling glass combine glamorous roll top baths and indulgent rain showers in one marble lined area. It's a clever use of space, allowing the suites themselves to be that much more spacious. Refurbishment of the St Ermin's Hotel included expansion into the building's original horseshoe footprint, creating a total of 331 high ceilinged rooms. They range from 18 square meters to 60 square meters and include 41 suites, 53 "executive" rooms and, unusually for a central London hotel in this price group, 18 family rooms. Family rooms have two Queen-sized beds and a sofa bed, two bathrooms, good storage, and facilities. Rooms, decorated in contemporary style, include large, flat-screen LCD televisions, multi-national electrical sockets, wired and wireless internet, MP3 docking stations and toiletries from The White Company. Caxton Grill - Mid price modern British and casual cuisine, popular with locals at lunchtime. Caxton Bar - Drinks and tapas. In good weather, drinks and bar snacks are also served alfresco on the Caxton Terrace. Afternoon Tea in the hotel library. Other facilities: A gym, beehives on the roof to produce the hotel's own honey, 15 meeting and banqueting rooms.